Katrina Vale is a talented ballerina. Her mother is a ballet teacher, but has to work as a cheap one. Therefore life’s so much on the poverty line that Mum collapses of malnutrition from having to cut meals, and she’s taken to hospital. 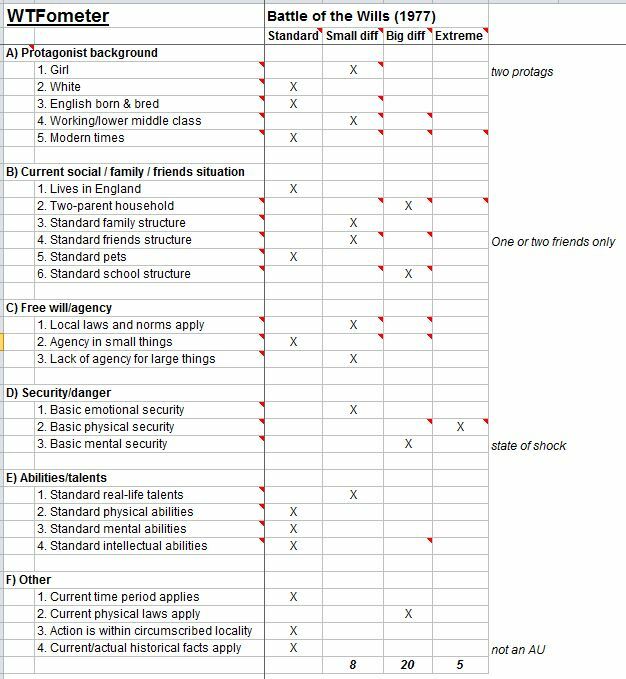 Katrina has to find a relative to look after her or it’s welfare, but Mum has never talked about any relations or her past life. A search of Mum’s belongings reveals she used to be a famous ballerina, under the name of Katia Groves. This is quite a surprise to Katrina, who was never told any of this, and is puzzled as to why things changed so much for Mum (yes, why did they?). Another ballerina, Rosa Kachinksy aka “The Swan”, was Mum’s best friend. Katrina finds the address for the ballet school Kachinsky runs in London and decides to go to Kachinsky for help. But in London Katrina gets hit by a hit-and run driver and loses her memory. She makes it to Kachinsky’s school but now has no idea why she came or who she is. Kachinsky catches on to who Katrina is, though. Unfortunately she’s gone from Mum’s best friend to her worst enemy because she blames Mum for being confined to a wheelchair. Now she intends to use Katrina to wreak her revenge. So she takes advantage of Katrina’s amnesia to feed her an orchestrated tissue of lies to make Katrina her slave and keep her away from her mother forever. It starts with Kachinsky telling Katrina that her name is Mary Black, and she’s been taken from an orphanage to work as a servant. Soon she is turning Katrina into a drudge who is lumbered with all the worst jobs around the place, and loving every minute of watching Katrina slave away. And of course she isn’t paying Katrina a penny for all the work; she tells Katrina that she’s living off her charity. But that’s only the beginning. Kachinsky gives Katrina a ragged hair cut while she’s in a drugged sleep to prevent anyone recognising her from newspaper reports of her being missing (and no doubt Kachinsky enjoyed giving the poor girl that dreadful haircut!). When Kachinsky sees Katrina stealing moments to dance she puts her feet into deliberately heavy boots, on pretext they are medical boots, to stop her dancing and anyone getting suspicious. The ballet pupils begin to notice how Kachinsky is treating Katrina. They sympathise with Katrina and tell her she’d being exploited. Their sympathy grows when Katrina plays a piece of music she finds and Kachinsky is so upset that she slams the piano lid so hard on Katrina’s hands that her fingers are badly bruised. They tell her that she was playing “The Swan”, a title role that was created especially for Kachinsky, and it’s where her nickname comes from. It was Kachinsky’s final triumph, for soon after she had the accident that crippled her. During this same incident Kachinsky made a slip that she knew Katrina’s parents. When Katrina confronts Kachinsky, she spins a line that the parents were thieves who died in prison. She takes advantage of Katrina reclaiming a piece of her mother’s jewellery to plant ideas in Katrina’s mind that she is a thief too. She also makes threats that if Katrina leaves she will get no references. After this, Kachinsky is confident Katrina won’t leave, no matter how badly she is treated. Seeing that the ballet pupils are getting suspicious and sympathising with Katrina, Kachinsky decides her next move is to turn them against her. She begins working on Sarah by making it look like Katrina is stealing from her. When the ‘theft’ is discovered Kachinsky spins out more lies about Katrina’s ‘criminal’ past right in front of the whole school. The plan works. Now the girls think Katrina’s a thief and turn against her. However, Sarah is still friendly and treats Katrina to a ballet performance. Katrina feels ballet is the key to her past and hopes for a clue there. There she hears people repeating a long-standing rumour that within an hour of performing “The Swan”, the woman who was Kachinsky’s best friend deliberately crippled her out of jealousy. That woman is Katrina’s mother. So now we know why Kachinsky is out for revenge. But from what we have seen of both Kachinsky and Mrs Vale, can we really believe the rumour is true? We need to get Mrs Vale’s side of things. Meanwhile, the police finally trace Katrina to Kachinsky’s ballet school. Kachinsky manages to mislead them, but then realises Katrina is missing because she’s still at the ballet. There Katrina has impressed performers with her own ballet talent. And while she was dancing, fragments of memory began to return, but they are not strong enough. When Kachinsky arrives she drags Katrina off and says she’s having delusions. However, Katrina is finally beginning to doubt what Mrs Kachinsky is telling her. She and Sarah go in search of the orphanage. Kachinsky finds out and pulls another trick: she leads them to a burned-out orphanage and takes advantage of it having been deliberately burned down and someone dying in the fire to have Katrina believe she’s a fire bug and a murderer as well as a thief, and she’s wanted by the police for it. She found Katrina in a daze after the ‘incident’ and took her in and kept her safe from the police because she believed she deserved a second chance. After this, Katrina is now well and truly in the power of the Swan, for she now believes that Kachinsky is her only friend who did so much for her. She now does any job for Kachinsky, no matter how horrible, without complaint or payment, because she thinks this is the only way to repay her. Kachinsky realises Katrina’s completely in her power now too, and is crying for joy. While Katrina spring-cleans Kachinsky’s room, she accidentally finds a secret room hidden behind the wardrobe. It is a shrine filled with Kachinsky memorabilia, and even includes the costume from “The Swan”. Then Kachinsky’s chauffeur gossips about Katrina being an arsonist and hysteria spreads about her pulling the same thing at the school. Kachinsky takes advantage to keep Katrina locked in a disused coal cellar to sleep. There Katrina gets a frightening visitor – someone in the Swan costume! Next morning she checks the Swan costume and finds evidence it has been moved recently, and concludes someone took it and used it to frighten her. The rumours about Katrina being an arsonist grow more intense. So when Sarah’s costume accidentally catches fire, tongues wag that Katrina caused it although she saved Sarah by putting out the flames. Sarah goes to hospital and now Katrina has lost her only friend. Katrina’s such a bag of nerves now about her ‘arson’ and everyone turning against her that she takes off in a panic when a policeman calls. She also sees a strange woman lurking around and thinks she is a plain-clothed policewoman who is on her tail. When she tells Kachinsky this, Kachinsky tells her that the woman is just a new ballet student, Rita Hayes. All the same, Katrina remains convinced that she’s right when Rita seems to be watching her, snooping around in her room and asking her questions. Meanwhile, the Swan costume is resurrected again. Katrina is surprised to find someone dancing in the costume in the ballet studio to “The Swan” music. She can’t see who it is because the headdress obscures the face. The mysterious dancer doesn’t seem able to dance properly. She throws a real hissy fit and smashes the ballet record. When Katrina goes to Kachinsky to report the matter she finds Rita snooping around in Kachinsky’s office. Katrina doesn’t listen when Rita tries to explain, and that it’s for her own good. Katrina alerts Kachinsky, but they find Rita has cleared out. Kachinsky realises Rita’s snooping must be because she is onto her game with Katrina and gone to alert the police. Not wanting to be cheated of her revenge before it is complete, she decides to get rid of Katrina altogether before the police arrive. On pretext she is helping to conceal Katrina from arrest, Kachinsky takes Katrina to a rusty old boat in the canal to hide, but in fact she means to kill Katrina there. When Katrina enters the boat she is surprised to hear somebody shut the hatch on her, which locks her in. For a while Katrina does nothing because she has been fooled by Kachinsky’s assurances that her chauffeur will come with supplies. Meanwhile, the police have arrived to question Kachinsky. The pupils are perturbed at how pleased Kachinsky seems to be at Katrina’s disappearance, which seems very odd considering what she had them believe about her taking care of Katrina before. Back in the boat, Katrina finally realises nobody is coming, but assumes it is because something happened to Kachinsky. But when the tide causes water to rise in the rusty old tub (as Kachinsky planned) Katrina realises she has to get out fast or she will drown. After a desperate struggle she succeeds. Katrina is in a dreadful state but, thinking Kachinsky did not return as promised because something happened to her, staggers back to the ballet school to check on her. There she collapses, in full sight of her mother, who recognises her at once. Mum has tracked Katrina down, with the aid of Sarah’s family and Rita Hayes. It turns out Rita Hayes was a private investigator Sarah’s family had hired to help Katrina; it was part gratitude for saving Sarah and part suspicion about Kachinsky’s treatment of Katrina. However, Mum now fears Katrina is dead. Seeing this, Kachinsky crows – right in front of everyone, including the police – she has taken her revenge at last by robbing Mrs Vale of her daughter. At this, the police arrest Kachinsky. But no – Katrina is still alive, and she regains her memory when her mother addresses her by her proper name. Mum explains to Katrina that she and Kachinsky used to be best friends at a ballet company, and she never minded that Kachinsky was the better dancer. However, following Kachinsky’s one and only (and unforgettable) performance as “The Swan”, she was crippled by a fall down a staircase and wrongly accused Mum of pushing her out of jealousy. The accusation was widely believed and Mum was forced to leave the stage. “The Swan” has never been performed since and the swan costume itself disappeared. At this, Katrina leads Mum and Sarah to the secret room full of Kachinsky memorabilia. Then in comes Kachinsky. She had given the police the slip – and she’s walking! She had secretly regained the use of her legs years ago. She kept it quiet because she could never dance properly again and couldn’t settle for anything less than perfection, and she enjoyed playing on people’s sympathy into the bargain. Katrina now realises Kachinsky was the one in the swan costume, and Kachinsky deliberately shut her in the rusty old tub – to die. Kachinsky gleefully admits both charges and tells Katrina “what a trusting little fool” she was to fall for those tricks and all the other lies. As the police take Kachinsky back into custody she raves that she still has more than Mrs Vale, who in her view has nothing. But Katrina does not agree – and neither do we. 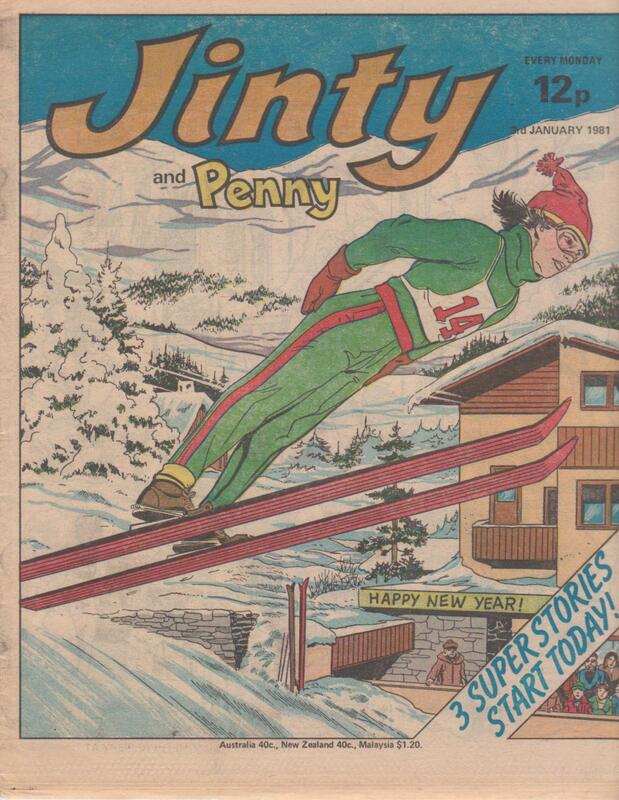 There have been hundreds of stories about unscrupulous people taking advantage of amnesiac girls for their own ends, such as Jinty’s “Miss No-Name”. But this one could well be the most disturbing, even sickening, of them all. Usually the people who take advantage of an amnesiac protagonist are just doing it for profit and unpaid labour. Feeding them lies about having shady pasts and being on the run from the police to blackmail them into staying is a pretty common trick; Mandy’s “The Double Life of Dolly Brown” aka “The Double Life of Coppelia Brown” is one example. But the antagonist in this story isn’t doing it for money – she’s doing it for revenge. Of course it is useful to exploit someone for unpaid labour, but that isn’t her real motive; it’s just part of her campaign for revenge. Having revenge as the motive for enslaving an amnesiac girl rather than the usual greed makes the story truly frightening. Revenge is extremely dangerous because it can drive the antagonist to the point where she has no limits. That certainly is the case with Kachinsky. She is capable of anything, including murder, to get revenge on the woman she hates. As Kachinsky’s revenge unfolds she reveals herself more and more as what a sick, cruel, twisted woman she is. She is not content with merely exploiting Katrina and keeping her away from her mother. She means to break Katrina entirely with endless psychological and emotional tortures at her ballet school, including using the swan costume to terrorise Katrina. When it comes to plotting murder, Kachinsky has no compunction or remorse about it either. When she tells Katrina to use a gangplank to go over to the boat she contemplates just pushing it away and knocking Katrina into the mud. But she decides against it because it’s too quick. She wants to watch and relish each minute of Katrina suffering slowly. Kachinsky is also extremely clever in the ways she constantly manages to block Katrina’s attempts to remember her past and twist it around to reinforce her lies even more, cut Katrina off from avenues of help, and ensnare Katrina ever more tightly. Kachinsky pulls it off so well that Katrina ends up thoroughly convinced that Kachinsky is actually protecting her, that everything she does is for her own good, and that she actually deserves everything that she is going through because of her so-called arson, murder and thievery. Katrina is so taken in by Kachinsky’s lies that she does not even realise she is being exploited. This makes Katrina’s situation even worse than other amnesiac protagonists; at least they understand the antagonists are abusing and exploiting them. But Katrina can’t; she’s been so take in and brainwashed that she thinks the woman who is abusing her is actually her only friend. Readers would have been crying for Katrina every step of the way, not only because of the abuse she is going through but also because she can’t see it for what it is. When it is revealed that Kachinsky had been faking paralysis all this time, it’s the last straw that puts her well beyond the pale. Her excuse for abusing Katrina is that it’s all revenge on the woman who confined her to the wheelchair. But when we discover Kachinsky isn’t really confined to the wheelchair at all – well, what a nerve she’s got there! The last possible reason for Kachinsky evoking any of our sympathy is gone. It is only when we see Mrs Vale’s flashback of Kachinsky before the accident that we feel Kachinsky is in any way tragic. We can see she used to be a very nice woman who would never have even dreamed of doing all those things she did to Katrina. And she would still be a nice, happy woman if she hadn’t had the accident. But really, Kachinsky’s hatred destroyed her far more than the accident did. It is no surprise to learn that Kachinsky wrongly accused Mrs Vale of causing her accident. This almost invariably is the case in revenge stories, and it makes everything all the worse for all concerned because we know it’s all been for nothing. Is Kachinsky insane? Or is she just so full of hate it turned her into an evil, twisted monster? It is difficult to determine. Kachinsky does not come across as downright insane, just sick, cruel and perverted. Only a psychiatrist can judge on her state of mind, but we never find out what the courts decide to do with her. We can safely assume that she will lose her ballet school, her reputation, and all the sympathy and respect people have for her. When word spreads, people are certain to rethink Kachinsky’s accusations against Mrs Vale, and her reputation will be salvaged. Mrs Vale may even become a teacher at Kachinsky’s ballet school, or even take it over altogether. Who knows? Whatever the aftermath, we can be confident that the Vales’ revenge will be sweeter than Kachinsky’s. Translation/reprints: Dutch translation “Als kat en muis” [Like cat and mouse] in Tina 1985; translated into Greek in Manina. Everyone avoids Kat Morgan at Barton Grange Ballet School because they all know she is a selfish, bullying girl who grabs all the best chances there are in the school, along with everything else she wants. What makes it even more distasteful is that Kat’s dancing is not as good as she thinks. Meanwhile, new girl Letitia (her last name is not established) arrives. She was not keen on coming because she is a shy girl and happy to be the only ballet pupil in her village because of it. She only agreed to enrol at Barton Grange at the urging of her ballet teacher, who says the school can provide far better tuition for her talent than she can. Shyness also makes Letitia gullible and naïve, so she proves easy prey for Kat’s false show of friendship. Kat has quickly realised what a sap Letitia is, and so she is taking advantage of Letitia to turn her into her personal handmaid. She also nicknames Letitia “Mouse”, and it sticks. But not even the humiliation of dubbing Letitia “Mouse” in front of everyone makes Letitia wake up; she meekly says she does not mind. Mouse does not listen to the girls’ later warnings that Kat is a creep who is making a mug out of her. Kat also poisons Mouse against Miss Randall the headmistress to make sure Miss Randall is not able to warn Mouse either. Eventually Mouse is left to stew in her own juice. However, Kat soon discovers there is one snag to having Mouse as her skivvy once she sees her dance – Mouse is a far better dancer than she is. Jealousy unleashes the Kat’s claws, for she is not going to be upstaged by that Mouse. So Kat now plays a double game of stringing Mouse along as her skivvy while sabotaging Mouse to keep her in the background. To make sure of both, she wangles things for Mouse to come and live in her house, where she really enjoys having Mouse wait on her hand and foot and fetching and carrying everything for her. It is the same at school. The girls notice how Kat is turning Mouse into her slave. But when they try to speak to Mouse about it she just thinks they are being mean. The double game has its drawbacks, though, due to Kat not thinking through the consequences of playing such a tricky double game. For example, Kat tricks Mouse into dancing badly at a test to make sure Mouse does not outshine her. But when Kat realises that this could get Mouse thrown out and she will lose her little skivvy, she quickly talks the teachers into letting Mouse stay, saying it was nerves. Then Kat’s mother finds out how Kat is turning Mouse into her slave. In punishment, she stops Kat’s pocket money for two months. This comes at a time when Kat wants money to see a new ballet, as they will perform it later at their school and there are two places at stake in a ballet company. Of course Kat wants one of them. As there is no pocket money, Kat steals the money Mouse asked home for. When Kat sees the ballet, she immediately sets her eyes on dancing the Tiger role in it. But Kat’s in for a surprise (and so are we) when she describes the Tiger performance to Mouse. Mouse visualises the Tiger so vividly that she puts up a stunning impromptu that has even Kat impressed. Realising Mouse could beat her to the Tiger role, Kat pulls more tricks to stop Mouse – and others – auditioning for it. But one trick backfires and gets Kat stuck in the lift. So she could be the one who misses out on the part. Sappy but kind Mouse isn’t having Kat miss out on her audition, so she dons the Tiger costume and pretends to be Kat. So thanks to Mouse, Kat gets the role. Now Kat has a new use for Mouse – have her stand in for her in the Tiger role, because she knows she could never top Mouse’s interpretation of the Tiger. Then Kat starts getting worried that it’s getting too dangerous and the school might find her out. So, although she has enjoyed having Mouse as her mug, she now plots to get Mouse expelled. However, one of the tricks rebounds when it causes Kat to get her leg badly bruised in an accident. Moreover, Kat won’t seek treatment because that would mean the end of her Tiger role. However, she can’t dance properly because of her leg and she has to perform in front of the Mayor, so she cons Mouse into dancing it for her. Moreover, she is making sure Mouse, who blames herself for the accident, is waiting on her even more. Kat is really enjoying it, but is now treating Mouse in a bad tempered way. Mouse puts it down to the pain in Kat’s leg. Yes, there is that, but of course the real reason is that Kat is taking advantage to bully Mouse into the bargain. Kat’s temper gets worse when she sees Mouse dancing the Tiger in the show. She realises that Mouse is getting even better in the role and her jealousy grows. Suspicion also grows when the girls comment on how well Kat danced with that badly bruised leg while Mouse looked like she had been dancing hard but she was not even in the performance. Kat gets so jealous of Mouse that she sabotages a special platform that Mouse will leap onto so it will collapse under her. However, it backfires when Miss Randall tells Kat to leap onto the platform instead. Kat tries to avoid the weakened parts, but fails because of her bad leg, and the platform collapses under her. Mouse saves Kat from serious injury – but oh, what a surprise! Mouse has picked up on clues that have made her suspicious of Kat. She now realises what Kat did and shouts at her over it: Kat spiked the platform, Kat betrayed their friendship, Kat hated her all along, they’re finished and she never wants to see Kat again. So now Mouse has finally seen through Kat and it’s the end of the story! Oh rats, it’s not. Kat isn’t finished yet. She is now even more anxious to get Mouse expelled before everything comes out, and now plots to frame her for stealing. And Mouse is still living with Kat, which makes it easier. One night Kat goes to steal money from the head’s safe and blame it on Mouse. Realising Mouse has followed her, Kat pretends to be sleepwalking while taking the money. Mouse takes the money back to the safe, but is caught doing so. Mouse can’t fully explain because as she feels it would be sneaking and foolishly thinks Kat didn’t mean it. She even thinks Kat did it subconsciously for her because she is poor! So she takes the blame and is expelled. The school has to wait for Mouse’s parents to come to remove her. So Mouse is put in isolation, but still around for Kat to take advantage of. Kat can’t dance properly because of her leg, and now the time has come to impress the ballet company director and get one of the two places. So again Kat wheedles Mouse into dancing the Tiger for her. However, the director is so overexcited by the performance that he rips off the Tiger mask on the stage, and everyone sees who was really doing the dancing. Kat has to do some fast thinking on why an expelled girl is dancing in her place. So she dashes off, ties herself up, and spins a story that Mouse tied her up and stole the costume. Even the unbelievably gullible Mouse has to well and truly realise what a toad Kat is after this, but she can’t prove it. Meanwhile, Kat is forced to go on stage in the tiger costume. But she can’t dance properly with her bad leg, and that mad dash to tie herself up has aggravated the damage. Her leg injury and its lack of treatment are soon discovered. Although by his own admission he is not a doctor, the director tells Kat that the injury will leave a permanent weakness in her leg, which means she can never become a professional dancer. Shocked to realise she has destroyed herself by her own dirty tricks against Mouse, Kat decides she might as well make a clean breast of everything and does so. At Mouse’s request, Miss Randall spares Kat the disgrace of expulsion and just lets her quietly leave because of her leg. Mouse gets into the ballet company and goes on to have a brilliant ballet career. There has been a common feeling about this story that it’s difficult to be fully sympathetic for the protagonist because she’s so wet and unbelievably naïve and gullible that she believes anything Kat tells her. Even when Mouse does see through Kat after the platform incident, it does not last long. Before long, Mouse goes back to falling for Kat’s tricks and thinking Kat’s her friend. Any respect we gained for Mouse in that outburst is instantly lost. And any hope we have of Mouse finding a whole new backbone that sets her on the road to more confidence is dashed as well. Mouse cuts off her own avenues of help by not listening to warnings, although this is partly because she has foolishly believed the lies that Kat has told her. Even when Kat’s mother finds out how Kat is treating Mouse and stops her pocket money in punishment, Mouse doesn’t open her eyes to it as well. She goes on thinking Kat is her friend whom she is only too happy to do everything for. All anyone can really do is watch and notice suspicious things that filter through, but they don’t have enough evidence to act on them. The scheming follows a fairly common pattern in girls’ comics, where the schemer starts off just playing tricks on the protagonist because she is taking advantage her or thinks it’s just a huge joke. But later the scheming takes a more spiteful turn, with the schemer deciding to get rid of her victim altogether. This is because she’s gotten bored with it, or it’s gotten too complicated, or the victim has done something that’s really put the schemer’s nose out of joint and she’s out for revenge. And it’s here that things begin to unravel for the schemer. Other stories that follow this pattern include Tammy’s “Dulcie Wears the Dunce’s Hat” and M&J’s “What Lila Wants…”. It is bad enough that Kat is playing a double game with Mouse, what with sabotaging her while taking advantage of her at the same time. But when it turns to scheming to get Mouse expelled, her conduct becomes really galling. Although she succeeds in getting Mouse expelled, she has the nerve to still take advantage of her because she wants Mouse to stand in for her in the Tiger role and be her unpaid servant. She isn’t even grateful to Mouse for saving her from the collapsing platform. Yes, she does say “thanks”, but nothing in her conduct or thoughts afterwards indicates true gratitude. Kat’s only redeeming quality is how she breaks down in the end and confesses everything, which saves Mouse. Could those tears be the start of a new improved Kat? We cannot say for sure, but we can be confident that Kat will never be the same again. It is a real twist that the Kat ends up destroying herself through her own subterfuge on Mouse. Kat won’t seek treatment for an injury that was caused by one of her own tricks, just because she does not want to lose the Tiger role. Yet she can’t even dance the Tiger because of her own injury, so she still has to use the very girl she is trying to expel. Moreover, Kat let her leg go untreated and worsened it with her final trick on Mouse, so it deteriorated to the point where she would never be able to dance again. In any case, she never had enough talent to really get to the top to begin with, so no amount of trickery would get her there. 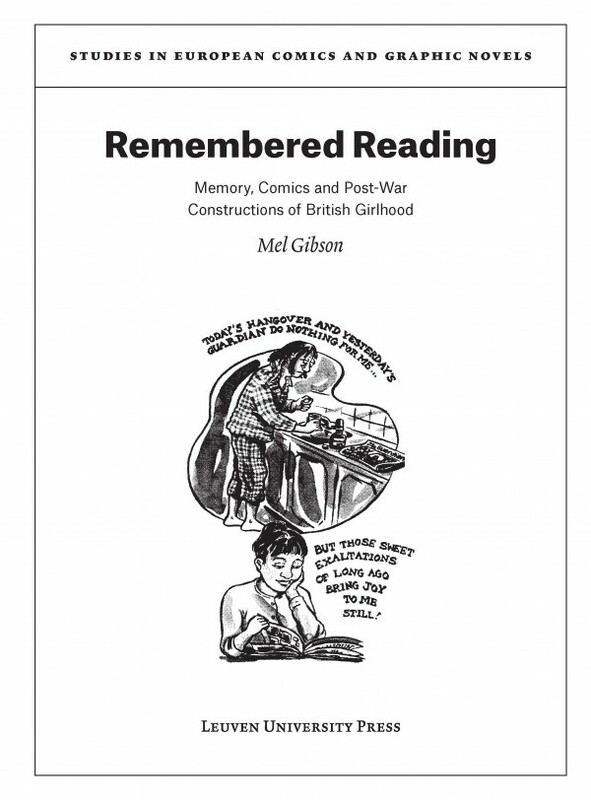 “Remembered Reading: Memory, Comics and Post-War Constructions of British Girlhood“, by Dr Mel Gibson; ISBN 9789462700307, published by Leuven University Press, June 2015. Reviewed by Jenni Scott. British girls’ comics are not much written-about, either within academia or within comics fandom. Even the people who read these comics as children tend to move away from then in their teenage years and forget about them as adults, until a deep well of memory is probed and an undercurrent of (often very strong) emotion is released. In looking at how people talked and thought about girls comics in the past, and how people talk and think about them still, this book is a great review both of the memories of the former girl readers, and of the criticism – often ill-informed or inadequate – made of these comics. So, what is the book all about, in more detail? Chapter One starts off talking in more detail about why it was so hard for Gibson to find copies of the girls’ comics she would have liked to work on: you might not have thought this was a particularly interesting aspect to lead off with, but it actually reveals some interesting attitudes on the part of the comics dealers she was in contact with. The dealers themselves had prejudices and misconceptions about girl comics readers: they argued that girls only got given comics out of duty and “did not really like them”, while at the same paradoxically still keeping them – meaning that dealers ended up with stashes of girls comics that they didn’t value either, and typically destroyed rather than sell! So a perceived lack of interest in girls comics becomes a self-fulfilling prophecy. 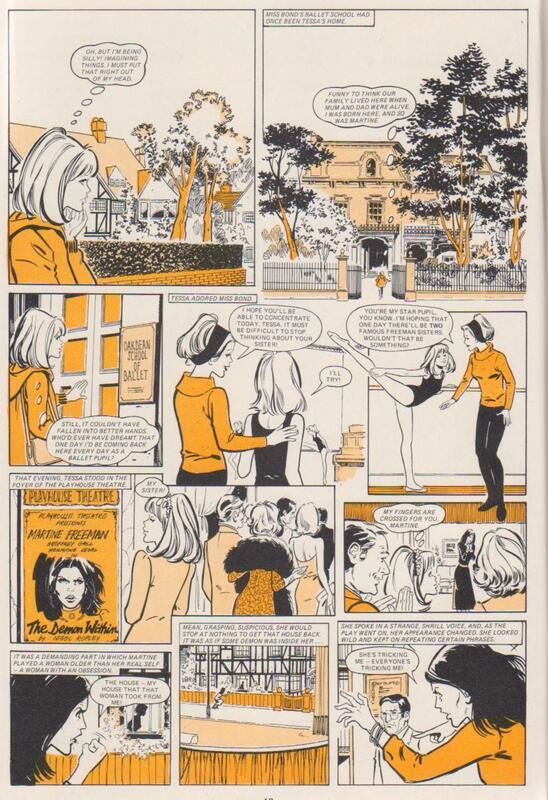 Mass media writing about girls comics, too, ‘flattens’ and reduces the diversity of comics actually produced and read, and paints the comics that girls read as being all about boarding schools and middle-class respectability. The section on Bunty and the subsequent section on Tammy and the new wave of comics will probably be of particular interest to readers of this blog, and won’t disappoint. There are some quotes from Benita Brown, who talks about writing the stories “Blind Bettina” (publication not traced), “Hateful Heather”, and “Cathy’s Friend From Yesterday” (both in Mandy). Brown also wrote the sports tips that appeared in Jinty, “Winning Ways”, and it is implied though not stated clearly that she wrote “Spirit of the Lake” too. 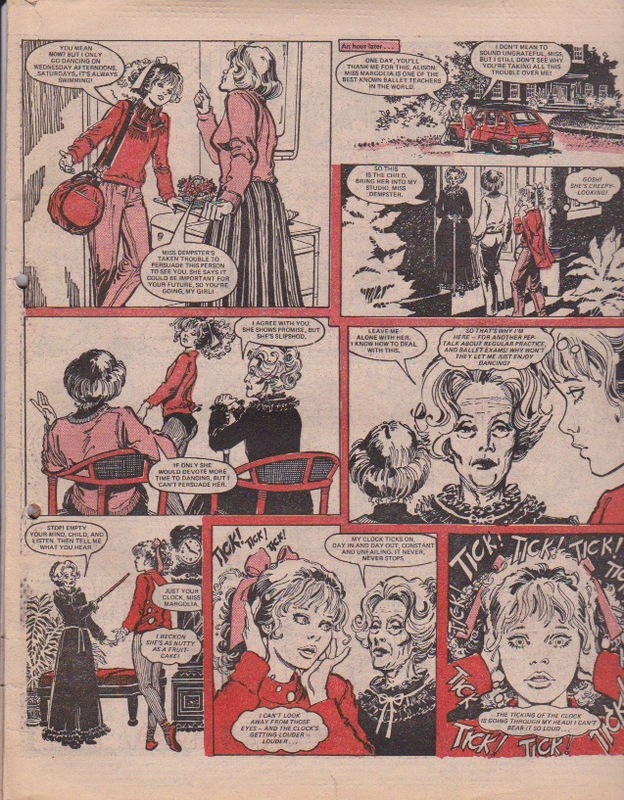 The final section is also interesting, covering the advent of photo-stories (illustrated by a parody one from feminist title Shocking Pink) and horror themes, before the death of the girls’ comic as a separate medium. Unfortunately for my personal interests, this chapter doesn’t go down to the level of detail I would ideally want to see about ‘production’ points such as sales data, who wrote what, who drew what, or editorial decisions and aims. Nevertheless it is a really good chapter that will give solid reference for anyone reading or researching in this area in the future. Chapter Three is about how librarians, academics, teachers, and others have thought and talked about comics reading in Britain. It looks at moral panics and the fears that adults who are gatekeepers for children have had about comics: that comics are dangerous unless vetted for appropriate content, poorly-made, and will incite their readers to violent, criminal, or otherwise undesirable outcomes. These fears applied to boys and girls but particularly vehemently to girls; there was also a class element to the fears, with working-class readers felt to be more at risk than others. These worries came from various sides of the political spectrum as there were also plenty of feminist critiques made: that girls’ comics were unnecessarily twee and limiting, that they had too many stereotypes, that they were created almost exclusively by men, that they encouraged a victim mentality (especially the Cinderella and Slave story themes, as you can imagine). On the positive side, Gibson counters these fears much more thoroughly than I’ve seen elsewhere. 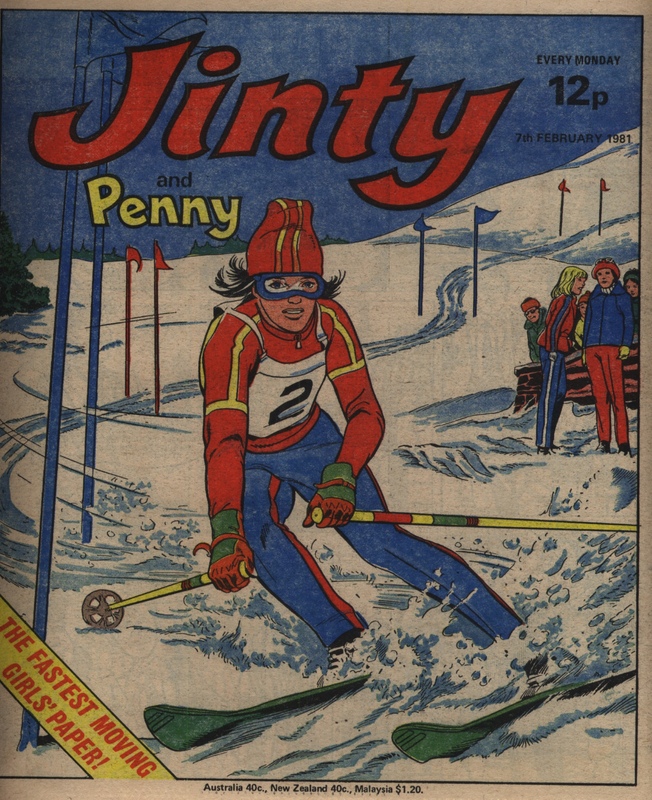 She cites Benita Brown as seeing her work in comics deliberately stretching the boundaries of the girls’ comics traditions; Brown also apparently “said that during her period of writing the majority of writers that she found out about, in both IPC and DC Thomson, were women”. (No further details were given on this statement – I’d love to hear more! 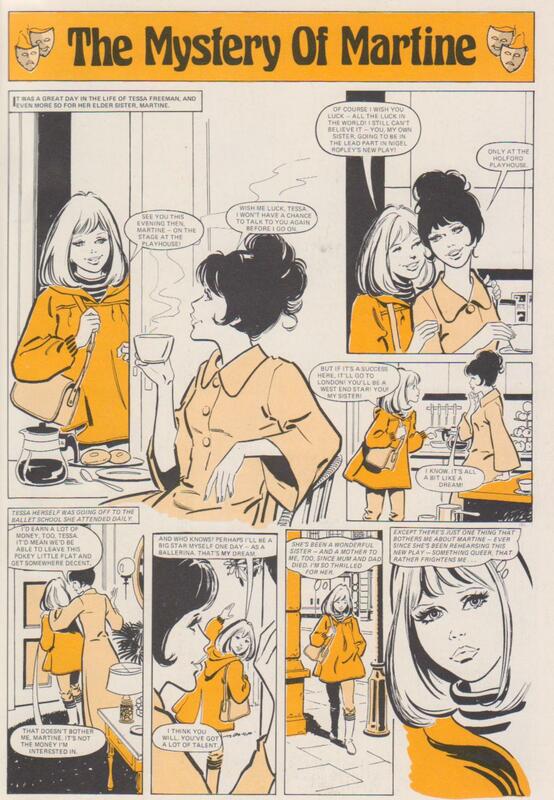 – I also note that Mavis Miller, who also shaped girls comics publications at the time, wasn’t mentioned.) Gibson also points out the contradictions in the ‘moral panic’ reactions to comics – that commentators are scared comics will make readers ‘lazy’ and unwilling to move on to ‘proper’ books while at the same time noting that high volumes of comics being read tends to go hand in hand with high volumes of other materials being read by the same people. Gibson also points out changes over time in what is shocking and deplorable – at one point ballet is risqué, then Jackie becomes worrying because of its content about boyfriends and fashion, and subsequently titles like Just Seventeen and Mizz seem just as problematic. Each generation sees “a shift in defining what girlhood is and what the concerns of girlhood are.” Furthermore, once you start talking to the readers of the stories about them in more detail, you get a lot more about how they are interpreted or understood by those readers: girls discussed and argued about what they were reading, they interpreted them in different ways, it wasn’t just a mechanical equation or imposition of stereotypes onto vulnerable readers. It is precisely that area of reader response that is so valuable in the subsequent couple of chapters. Chapters Four and Five are based on her interviews with readers of comics. It covers (of course) girls reading girls’ comics, looking at interview data to see how women talk about their girlhood reading and comparing this to academic writing that often makes incorrect assumptions about how that worked. Pleasingly, Gibson also covers boys reading girls’ comics, and girls reading comics that aren’t intended for girls (or not straightforwardly – she argues that even humour comics intended for a mixed audience are more firmly marked as being for boys than you might think). Gibson showed through these interviews what readers of this blog will know from personal experience: girls don’t only read girls’ comics as might be assumed, they also read humour comics intended for a mixed-gender audience (The Beano) and titles intended for a male audience (Eagle, superhero comics). They read across class lines (there is often awareness of the idea of comics as a ‘lower class’ thing unless you read the ‘posh’ titles such as Girl). Most of all, readers read widely – borrowing other people’s comics, swapping, buying multiple titles per week – often communally, and with strong feelings about those comics even when remembering them as adults. Comics were fun to read and remembered fondly, but were also an important part of growing up: the transition from reading comics to reading magazines was often a marker of teenagerhood or early womanhood, and not infrequently this transition was forced on the reader to some extent by parents or by peer pressure. So on the one hand comics showed you ways of being a girl in British society (which you might reject by reading boys comics instead, or by interpreting the story differently from the way adults did), and on the other hand they were something you were expected or made to grow out of and put behind you – they belonged to childhood. And girls comics stayed in one’s childhood, unlike the boys comics which have generated a collector base and fandom around them. Grown women are not, in our society, supposed to be still interested in those childish things for their own sake (though they are allowed to read comics if they have children who they are buying them for), and grown women do not as a rule, indulge themselves in re-buying their old comics and participating in ‘collecting’ activities. This is especially the case considering that comics are quite strongly marked culturally as being ‘for boys’ and ‘for men’, apart from the girls comics which are marked as being ‘of the past’. Some women will buck this trend, of course, but as exceptions to the rule. The book ends with a good selection of end material, with an index and bibliography that has given me leads for further investigation in the future. One very welcome feature is a list of stories under discussion, which shows convincingly the wide range that Gibson covers. An index is also always useful, though a couple of quibbles – why not include Benita Brown in the index? (Pat Mills is also quoted but not included, so presumably no creators are listed in the index, but this still doesn’t make good sense to me.) Also, why is there no list of figures? There are only about 6 of them so it wouldn’t be a long list but it would be handy to refer back to and seems a striking omission for a book about comics. I have a host of follow-up thoughts on this in terms of questions this book sparks, and further things to be looked at. This post is already very long though so those will continue separately. Sisters Tessa and Martine Freeman are pursuing promising careers in the arts; Tessa is preparing for a ballet audition at a ballet company while Martine has landed the starring role in Nigel Ropley’s drama, “The Demon Within”. Unfortunately this is where the trouble begins and it creates the titular mystery that is never really solved. Martine is playing the role of Vivien, a crazed, grasping, demented woman who has an obsession about getting her old house back from its current owner. She stops at nothing, “as if some demon was inside her” and increasingly acts in a manner that suggests she is possessed. Whenever Martine, onstage playing Vivien, hatches some sinister machination to take back the house, she clicks her bangles in a manner that sounds sinister, even off stage. The play climaxes with Vivien burning down the house when she decides she cannot get it back – with her enemy inside. Even when she is arrested, she still looks triumphant. The play is also triumphant, but Tessa soon finds that Martine still acts like Vivien, even off stage. The same facial expressions, vocal expressions, bangles, clothes – as if she is becoming Vivien in real life. And there is a disturbing parallel with Vivien’s situation – Tessa’s current ballet school used to be the Freemans’ home. Now Martine is becoming obsessed with getting that house back Vivien-style. She starts hanging around the ballet school, clicking those bangles and staring at the house in the sinister manner of Vivien. She starts regarding the ballet teacher, Miss Bond, in the same manner that Vivien regards the woman who took over her house. At home, Martine starts behaving like Vivien to Tessa and other people, which is truly frightening. It also causes trouble with the other tenants in the apartment block. It doesn’t happen all the time – she usually returns to normal, but then she starts acting like Vivien again. Tessa is astonished when Martine agrees to pay her ballet fees, but she soon finds that this is a Vivien plot – it was a ploy to get into the ballet school and start harassing Miss Bond. In the midst of all this trouble, Tessa still has to keep practising for her audition. Amazingly, she still manages to keep up with it. But of course there has to be a jealous rival out to make trouble, and in this case her name is Julie Worral. Julie starts causing trouble when Martine leaves a nasty note to Miss Bond “You are in my house. Get out or face the consequences”. Miss Bond throws the note in the bin and tells Tessa her concerns about how this will affect her dancing. If it proves detrimental to Tessa passing the audition, Julie is the next choice for it. They do not realise Julie has overheard. Martine’s harassment of Miss Bond gets worse. She removes Miss Bond’s furniture and tries to move her new purchases of furniture into the house. Tessa has the furniture taken to their flat, but this gets the Freemans threatened with eviction. Tessa tries to get Martine removed from the play, but Martine convinces Nigel that Tessa is just jealous. Meanwhile, Julie retrieves the nasty note and tries to use it to blackmail Tessa into backing out of the audition. And then Tessa remembers that Vivien burned down the house she could not reclaim and realises that this is what Martine will do. Sure enough, Martine is heading to the ballet school with a petrol can. However, an accidental fire (caused by Julie) starts instead and Martine is found unconscious on the lawn. The reason – Nigel noticed things and came to realise that Tessa was right. However, he decided that the solution was to rewrite the ending of the play. The new ending has Vivien’s personality changing from evil to good (and also makes for a far better play). The moment Nigel finished it, Martine says she felt Vivien go out of her and she was herself again, and then she just passed out. They are still not sure how it happened and conclude they never will know. But everything is sorted out happily, of course. The play, with its revised ending, goes to London where it is a huge success while Tessa passes the audition. Both sisters can now look forward to being stars. This is an evil influence story, but with two major differences from the formula. First, it is never revealed just what the influence was or what caused it. This is a complete deviation from the standard formula, where it is always obvious what the evil influence is – at least, to the reader. The victim may start off knowing what it is herself as well, as in Jinty’s “Slave of the Mirror”. Or the victim does not realise what is going on until something – or an astute someone – tips her off, as in “Prisoner of the Bell”, also from Jinty. Either way, the reader is usually informed as to what it is that is taking hold of the protagonist in the first episode. Yet in this case, the reader is kept in the dark. Readers must have expected that everything will be explained by the final episode. But no – right up to the end it remains just as much a mystery to the reader as it is to the protagonists – and becomes a double pun on the “Mystery” in the title. Instead, readers are left to draw their own conclusions. Was it some kind of psychological cause? Was Martine getting so wrapped up in the role of Vivien that life started to imitate art, so to speak? Or was there truly some supernatural force at work? Indeed, there are hints of demons and possession in the play, and Nigel’s solution to the problem sounds ominously like exorcism. The mystery of it all makes it even more frightening because we do not understand what it is exactly that is making Martine act like Vivien. Second, the evil influence story usually focuses on the point of view of the victim of the influence. We see her thoughts as she falls under the influence and her reactions to it: confusion, terror, bewilderment, desperation, torture, trying to make sense of it all and finding ways to deal with it. But here the story is told from the POV of the sister who is watching it all from a terrified, bewildered and desperate standpoint. We never get Martine’s point of view or thought bubbles that tell us what is going on in her head. And because we do not see this, we do not have the insight that can shed light on just what is happening to Martine. Nor can we see just what she is planning when Vivien takes over, so we have no idea just how or when she will strike. So we are all the more worried and frightened when Martine lurks around the school with that Vivien look and clicking those bangles. So having the POV from the sister rather than the victim makes the story even more frightening and helps to preserve the “mystery”. 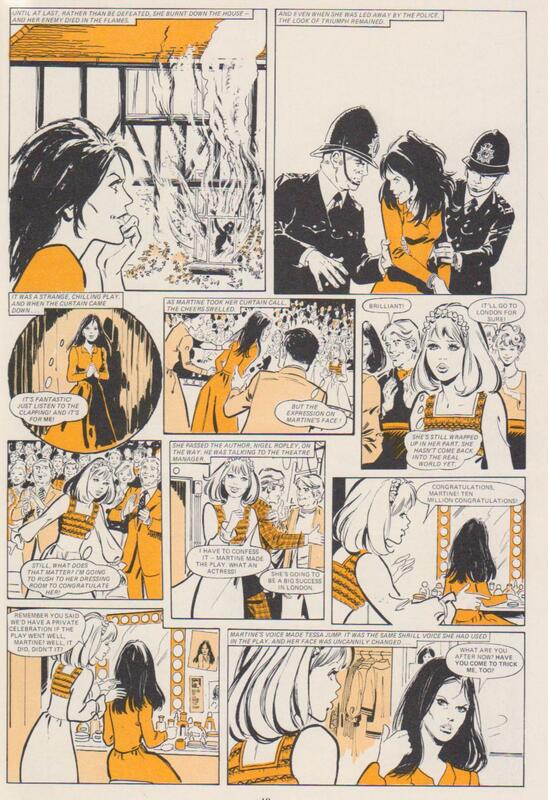 Comix minx has commented on how Tinturé “seems particularly good at brunettes with snapping glares”. This is perfect for the facial expressions of the seemingly possessed, demented, crazed Viviene/Martine, such as where she sits on a chair, clicking her bangles, and her face is “terribly transformed!” There is even a wild look about her flowing black hair that further enhances her terrifying Vivien look and must have sent shudders up the spines of readers.